The application specializes in a 1~5 people SMB environment. Up to 20 Gbps wire-speed switching performance and up to 14.9 Mpps forwarding rate across all 10 ports. Up to 4K IEEE 802.1Q VLAN feature supports flexible network deployment. 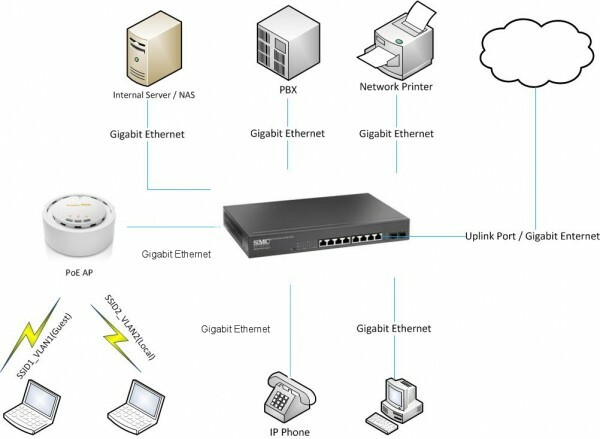 In the application, network administrators can easily separate public LAN and private LAN only in following few steps Quick Installation Guide. Green Saving feature supports auto-detect link status and distance to best save power while maintain performance and stability with LED power reduction as well.